Whether you're designing a room from scratch and need inspiration or are looking for easy updates that will give your space a trendy, retro feel, our pick of the best geometric wallpapers show just what striking repeat patterns and cool colour combinations can do to the feel and dimensions of a space. From intricate designs and 3D prints to standout patterns and bold brights, there's a style to suit all tastes and all bedroom or living room redesigns. Find more gorgeous wallpaper designs on our dedicated page. Hanging wallpaper with an intricate repeat pattern so that the design runs horizontally (see below) is an easy design trick that will make a space seem wider. Want to add height to a room? Simply reverse the trick and hang wallpaper so the design runs vertically. We love the combination of the Scion Sioux Wallpaper, available at John Lewis & Partners, with Mid-century furniture. Find more Mid-century modern room design ideas in our gallery. Opting for a wallpaper with a bold colour – such as orange – is an easy way to inject energy into a space. Pair a bold wallpaper with toned-down interiors if you're worried about a space being overwhelmed, or choose fabrics that match for a more cohesive look. Find this P.L.U.T.O Wallpaper in Tangerine Dream and Silver at Mini Moderns. 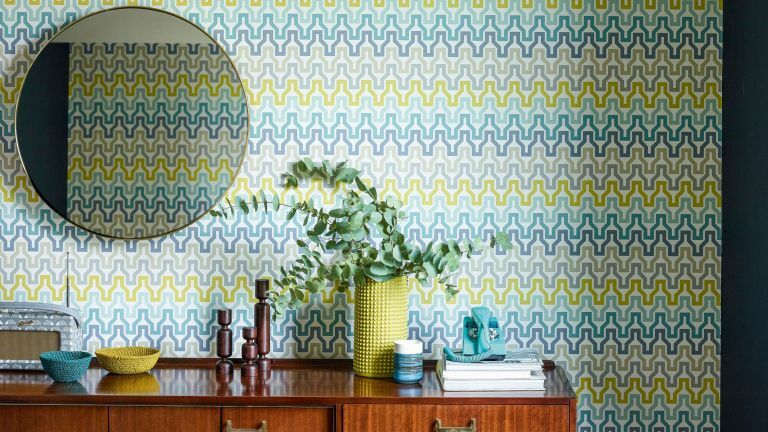 If you like the idea of a bold, geometric wallpaper but worry that it will leave your home looking overwhelmed, there are a few tricks that can help to tone things down. Firstly, consider pairing one wallpapered feature wall with plainer painted walls – we think this Green Blocks Wallpaper from Susi Bellamy would work perfectly with Bowery Blue from Abigail Ahern or Soft Linen from Crown, depending on your taste. Choosing furniture with unfussy, natural textures is also helpful in toning down a vibrant print. If you're keen to incorporate a retro inspired, geometric wallpaper into your home, feature walls can be the best choice as they prevent a room from feeling overwhelmed. 3D effect wallpapers are particularly useful if you're looking to add depth to a space. We love this Geometry Wallpaper by Mind The Gap. Find more (toned down) feature wall ideas in our design gallery. Offering a great alternative to the many bold and bright geometric prints available, wallpapers with an earthy toned, neutral colour palette can make for a more sophisticated finish. Pair with similarly neutral toned furniture and natural materials. Find this Perspectives Wallpaper at Mind The Gap. The great thing about geometric wallpapers is that some of them are so intricately designed they function almost like an artwork, with endless details to be discovered. This gorgeous, 3D effect Miami Wallpaper from John Lewis & Partners has a distinctly Escher-inspired feel to it, meaning it not only adds depth to a space, but won't get boring any time soon. To create a space with a cohesive feel, try to pair your choice of retro geometric wall mural with a complementary paint colour – this is most easily achieved by choosing a paint that either matches, or has the same hue as a shade featured within the mural itself. We love this Miami Electric Wall Mural from Wallsauce. If you love the idea of geometric prints, but don't want to commit to big, bold patterns and colours, opt for a wallpaper with a pared back colour palette. We love this Navy Eclipse Wall Mural from Wallsauce. Its large repeat print and pop of happy yellow detail works perfectly in a contemporary setting, hinting at the retro geometric trend without overwhelming the space. We're a big fan of yellow if you're looking to channel the retro geometrics look. If you really want the sunnier shades to pop, pair them with lots of natural materials – we're talking stripped back wooden floors – and white accessories with simple silhouettes. Find the Horseshoe Arch Wallpaper at Not On The High Street. A bright and bold geometric wall mural is an easy way to transform a tired looking space and is well suited to a room with otherwise pared back interiors – we're talking neutrals, natural materials and simple silhouettes. We love this Night Club Geometric Wall Mural from Wallsauce. Made to measure, it's easy to put up and can be removed as soon as your interiors tastes change (or as soon as you move out, right renters?). Into the idea of wallpaper and need more inspiration?